Okay, now it really is Fall! I am a hold out. I am ready to welcome Fall. 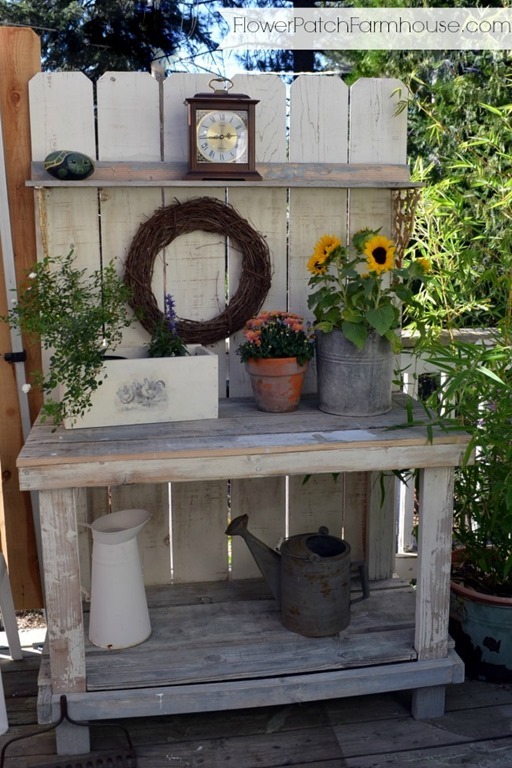 Since I still do not have a mantel (found one I want to build but have yet to get there) I decorate my potting bench. 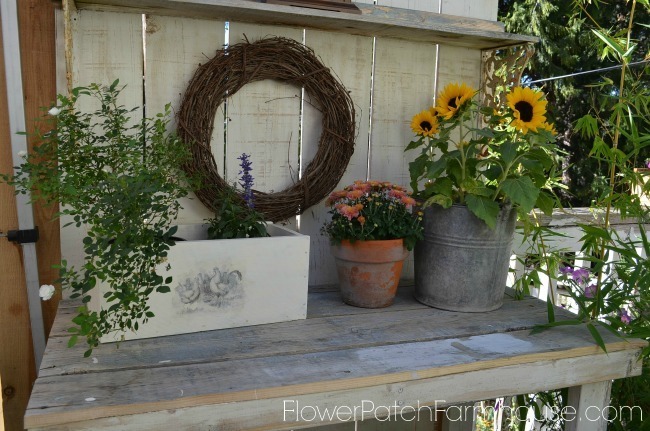 Here I decorated my potting bench for Fall! I have been using it all summer for various tasks, it has been so very useful. when I gave an easy Sunflower painting tutorial. The potting bench worked fabulously. 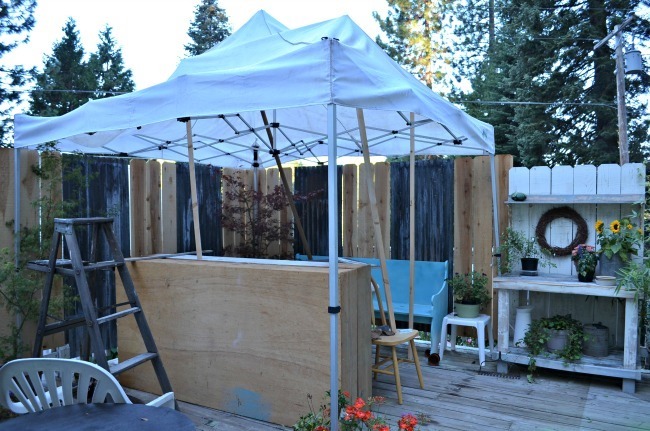 I love painting out on my back deck…. Here is how I decorated it last year. While dinking with photographing and staging the bench I was also trying to shove things under my canopy tent. The poles were supposed to prevent rain from pooling, it rained so hard and so much that it was a losing proposition. I really had wanted to move it all into a better protective area but my husband kept insisting this would work fine. 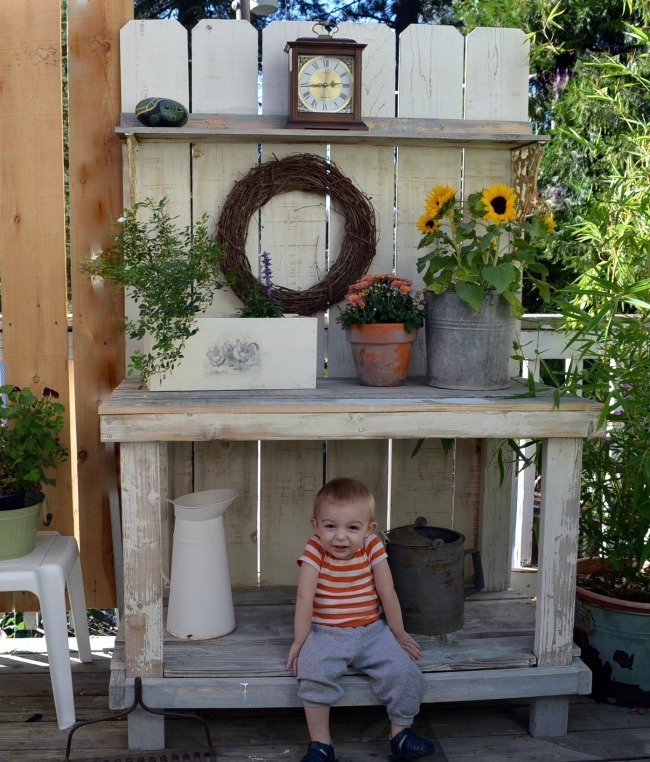 I especially wanted to protect my table I am painting with Miss Mustard Seed Milk paint. I could be mad but I had a gut feeling it would not work and should’ve gone with my instincts. I think it will sand out okay. I will give it a whirl. Back to my potting bench for Fall. I had a little helper arrive. He is my little Pumpkin. He is the finishing touch to my bench. Today I clean up the mess under the tent and I have signs to paint. I know Fall is here as I had to turn on my heater in the studio last night so it would be comfy in there to paint today. Yep, summer is over. But I still have a few garden photos to share. Your potting bench is multi-functional! Love it 🙂 Your little pumpkin is adorable! Too bad about your table. The table top peeled completely so I will sand it good and start again, the base seems to be just fine. Wow, I love the bench, especially with that little accessory on the bottom shelf 😉 Boy is he a cutie! Hope your table finishes up well. I have faith that you will make it look beautiful. Sand paper is my friend, the entire top bubbled and peeled but it is fixable. 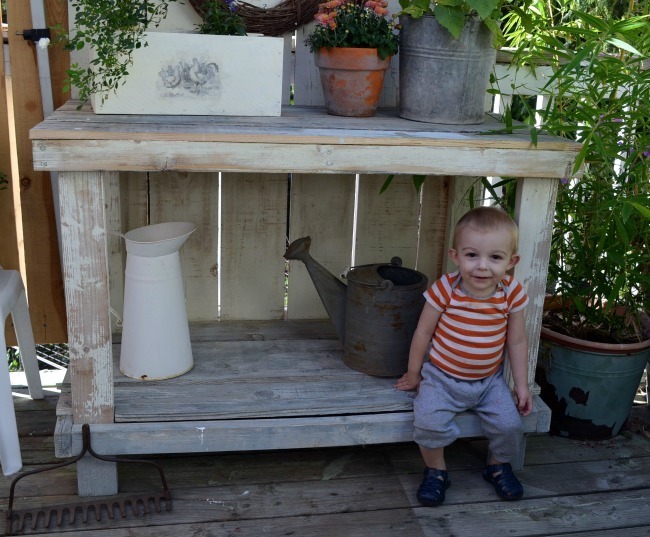 love the potting bench, would love to make one just like this some day! It is fairly straight forward and this one has been outside in all sorts of weather and has held up fabulously. I called my kids “little punkin” and my grandlittle the same….yours is adorable. In fact he is so cute in this picture that I doubt anyone can look at it without busting out laughing in delight! I know, he stole the show. Pamela, the little guy is definitely a cute little punkin! 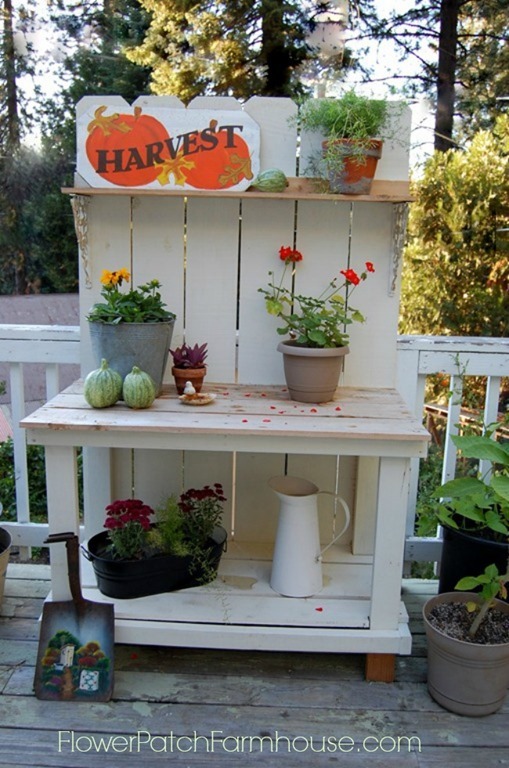 Fun idea to decorate your potting bench for Fall. Thanks for sharing with SYC.